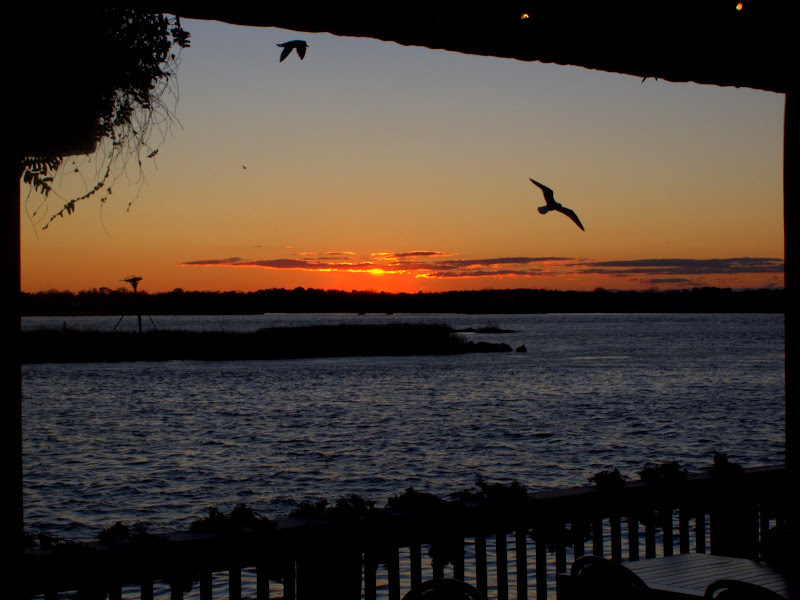 - The sun sets over the Lynnhaven River in Virginia Beach, Virginia tonight. We had an early dinner at one of our favorite places in Virginia Beach, Bubba's. As you can tell the view is second to none, the seafood is fresh and everyone is friendly. It was a little too cold and windy for dining on the outside deck tonight. I recommend Bubba's to everyone visiting Virginia Beach. The general composition rule is to avoid the horizon line being right in the middle of the picture. The preferred placement is one third from the top or bottom but I wanted to frame this picture with the outside deck. So rule are made to be broken, hope you like the image. Canon G11, 1/320 sec @ f/6.3, ISO 200. Nice of the gulls to pose for you. There were many gulls flying around along with a few pelicans but I just got lucky with this shot. I'm sure I'll be contacted soon by the gull's agent.